If you are worried that you have an aggressive dog whose behaviour is becoming a problem, you will probably need to get some professional help to resolve the issues causing the aggression before someone gets hurt. It is important to remember that the most commonly-seen aggression in dogs is a symptom of fear, and it can be fear of many and various things. The key is to understand what ‘fear’ is triggering the aggressive behaviour in your dog. Just like in humans, fear triggers the ‘fight or flight’ response in dogs too. They must choose to either run away, or fight the something or someone they are afraid of. Some signs of the potential for fear-based aggression are easy to recognize because you will see and hear your dog’s reaction. Your dog will have its ears pinned to its head, its mouth open and panting, and possibly teeth bared. You will probably see the whites of your dogs’ eyes. Their tail gives less away. It could be firmly between the back legs, as you would expect from an anxious dog, but it could also be neutral to down and wagging Please remember, a wagging tail DOES NOT necessarily mean a dog is happy! Fearful dogs will often "snap and retreat" because they're trying to get the thing, person, or object away rather than trying to confront it and inflict damage. 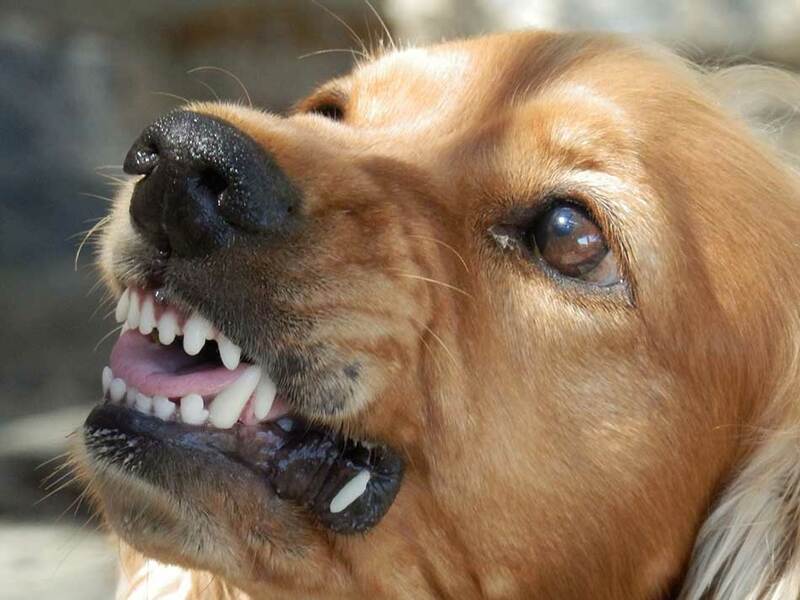 Even if your dog is aggressive around food, this can be a symptom of fear. It’s not the food that the dog is afraid of, but the potential lack of food and the fear that it may be taken away. What event or sequence of events create an aggressive reaction from your dog? My dog shows aggression to other dogs but only when on lead. My dog is aggressive to strangers coming into the house, or when out on his lead. My dog becomes aggressive to family members who approach his food bowl or toys. My dog is fine with my children, but is aggressive towards visiting children. My dog shows aggression towards men in hoodies/hats. My dog is generally nervous and anxious, and reacts aggressively to most new things. Next, you may want to consider when did the aggressive behaviour start? Was there a specific event that caused your dog to become aggressive? Has he been attacked by another dog in the past? If he is a rescue dog, has he been mistreated by a previous owner? Has there been a time in his life when food may have been in short supply? Is he just a nervous creature who is afraid of anything and everything - dogs who were not socialized properly and exposed to lots of experiences as puppies, are more likely to have many fears. However, it is also possible that the same thing can be said about the reverse. Dogs who have been overexposed to sounds and loud noises from puppies can also grow up to be fearful of noises and particular events. Once you have begun to identify the root of the problem, and the trigger, you can take steps to deal with the fear. You can begin to teach your dog, gradually and carefully, that he does not need to fear the object of his discomfort any more. This takes time, and you may need some specialist help. In some cases, it may not be possible to eliminate the fear completely, but you will be able to teach your dog to deal differently with the fear and respond in a different way. You can start by altering the way you interact with your dog and don’t pander to him when he is uncomfortable. Behave with confidence around him, and show some kind, consistent leadership so he learns that, if you feel confident in any given situation, all is going to be ok. Start in the home by teaching him to stay away from the hallway when you are answering the door, because you are capable of handling whoever may be knocking. The dog only needs to relax and leave you to it. For generally nervous and hyper-reactive dogs, you could also try considering a better diet that provides your dog with the nutrients needed and doesn’t fill him up with additives and preservatives that can cause hyper-reactions to normal events. A good-quality diet that is in plentiful supply, and the time and space to eat without interruption, can also help dogs who are fearful understand that there is enough food available and that food bowls and their contents don't need to be jealously guarded. When dealing with aggression, there is no "one size fits all" approach. Different situations will involve different training techniques. Bark Busters® trainers are often called upon to help dog owners overcome aggression. In fact, we are one of the few training companies willing and able to take on dogs with aggression issues. Many dog owners are frightened that their dog's aggression cannot be curbed. However, with patience, we can help owners make behaviour changes in their dogs, and whilst some dogs will struggle to overcome their fears, they can be taught to behave in a different way and look to their owners for guidance, rather than react. The worst thing you can do with a fearful dog is to use punishment-based techniques that can make the situation worse. Bark Busters® believes the only hand you should lay on your dog is a loving one. If you are struggling with aggressive behaviour from your dog, feel free to give us a call and we'll be more than happy to help.